Now all Violet has to do is reply to the email I will be sending her in a few minutes with her full name and mailing address and I will mail out the $25 B&N GC! 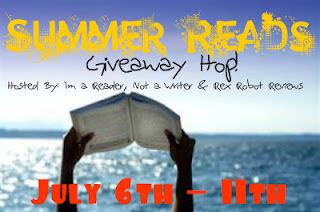 Thank you to Kathy I Am a Reader Not a Writer and her Co-Host Rex Robot Reviews for putting this giveaway together!! I remember when life was less hectic and I did not yet have to work--I would take myself outside with a book and read the day away!! But, then as now, I like to pick out what I want to read--so for this giveaway--I will be giving one lucky winner a $25.00 B&N GC. feeling bad bought the book anyway!) Simple yes or no will do! Here is the list of all the other bloggers participating!! Be sure to go check out what they are giving away!! No, I haven't done that yet. Thanks for the chance to win! I'm entering only if this can be changed to other card - like The Book Depository or Amazon because I had problems with B&N already :( Anyway! I have sat in polish bookstore called Empik (it's pretty much like B&N) and started to read. But it's allowed there, they even have pillows and chairs and tables :D I love this place. No i have not ever done that..
No I haven't - not yet at least! Yes I have done that...all the books are just too tempting! No, I usually know what I want before I go in. Does every single time I go in there count? I'm not sure it's possible for me not too get enthralled by a book I pick up. Absolutely--even though all the B&Ns near me are a good hour or two away, and it makes me miss the bus back home! I have never stayed at a book store long enough to read an entire book. The exception to that when I am looking to buy a picture book for a child. Then I will read several books to find them a great one if I don't have any others in mind. There isn't a Barnes and Noble here but yes I have done that. No, it's too busy in the store! I follow on GFC as XArea51. We don't have a Barnes & Nobke here in India. Nope but I can't get out for less than $100. I stalk you on Facebook. I stalk you on GFC. Thanks for the great giveaway! I LOVE Barnes!! I have! I usually sit on the floor in whatever aisle I happen to be in. I actually haven't done that before. I think I tend to get overwhelmed and just want to make a decision- and for some reason- i don;t look through the book to do it, which is silly. I don't know that I have gotten so into a book that I have actually finished it while in the bookstore. My family hates to go to a bookstore with me, though as I can just browse forever even if I have the intention of going in for one book. No, have never sat down and read at a Barnes & Noble. Thanks for this amazing giveaway - I would love to win! Like you on FB as Suz Reads! Follow on GFC as Suz! No, its always so busy. No, but I have spent a large portion of time in B&N before! Thanks for the giveaway! Yes, I have always done that since I was kid when my mother used to take me with her. I would say bye and go straight to the kids section find a few books and sit down and read though I preferred sitting on the floor of the aisle so I could grab more. I haven't. I know if I sit down I'll never leave and then my kids will starve lol. No, I haven't. The whole concept still feels uncomfortable to me. I guess I am just too old-fashioned. Haha! Yes, I have and I did buy the book. I love the opportunity to win a GC. Honestly no. I try sometimes, but then get too distracted by all the books around me. Usually I just eventually end up walking around and run my fingers across the spines on every single shelf. I have done that several times. Sit down with a coffee or cappuccino and lose myself completely. Wonderful! Yes, & I did what you did! Liked you on FB, too! All 4 of those extras done! I'm @AndreaCoventry and you can find all of my stuff via Facebook. Never! The workers at my BN are always hassling you about something. So I just run in, get what I need and run out as fast as I can.